One of the cool things about drupal, the engine behind my website, it that I can customise the way pages are displayed for different people. When I look at the front page it has all sorts extra bits if info so I can see how many people are online (68 at the moment!) who has left a comment, and various bits of debugging information. All the extra stuff is just kind of dumped on the page but it's useful and I thought that some of it might be interesting for everyone. 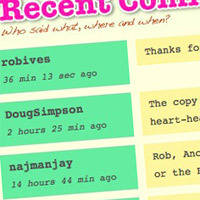 To that end, I've added a 'recent comments' block at the bottom of the front home page. This took much longer to do than it should have done – I had CSS brain fade and got completely stuck after failing to spot a really basic mistake. It was so frustrating going round and round in circle that by the time I'd spotted the mistake I could have danced for joy! Anyway, all working now. Write some comments and see it work! Friday Morning: I've changed the way the comments look. Less space – more comment and rather than a preview of the text I've put up the title of the post being commented about. If I had a problem, my old Da used to say, "Sleep on it." I have since discovered that very often the problem has been caused by a mistake or over-sight on my part. And, curiously enough after a night's sleep I do wake up with the solution in mind! The sub or un- conscious working on the problem while we take a breather? Surely I should be able to figure this out, but what/where is the "Front Page"? My apologies, Front page = home page. Divided by a common language. Is it the page I reach when I type "http://www.robives.com&quot; into my browser? Wise words from your Old Da Deal! Error on the home page. Some kind of code, eh? Thanks, i think I've fixed that.